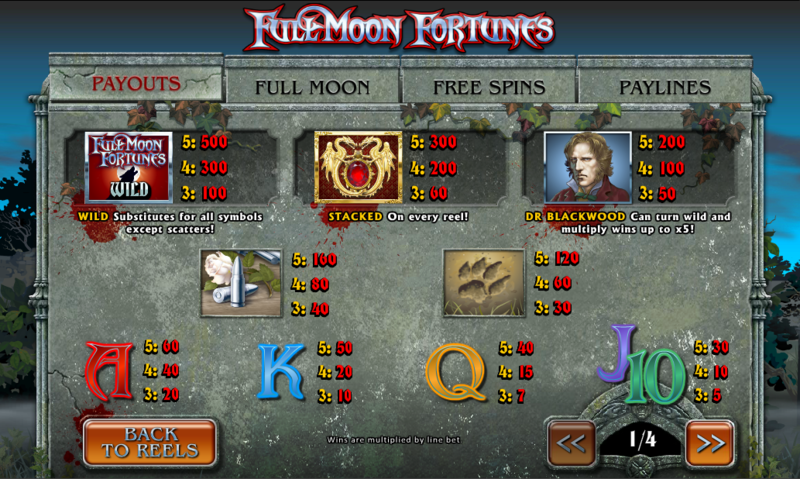 As Halloween approaches what better game to review than Full Moon Fortunes, the werewolf-themed online slot from Ash Gaming. This company has a track record of developing high quality slots and fortunately Full Moon Fortunes continues that tradition. Spooky music and two bonus features mean this is a game best played with the sound turned up and the lights turned down. 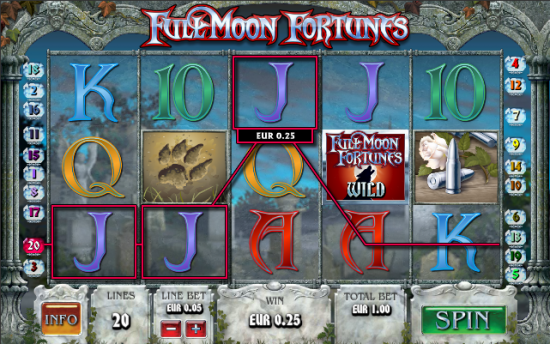 Full Moon Fortunes is a fantastically gothic slot with five reels and twenty paylines; the narrative tells of Dr. Blackwood who is bitten by a mystery beast, becoming wild when the full moon is in the sky. A silver bullet, a paw print in the sand and some basic playing cards make up the majority of the symbols but there are also bonus symbols in the form of a howling wolf wild, a red jewel wild, Dr. Blackwood himself, a full moon on reel five and a gravestone which triggers the free spins. If you can land the full moon symbol on reel five, Dr. Blackwood will become wild and transform into a hairy monster; any wins line to which he contributes will be subject to a multiplier of between 2x and 5x. That’s just the initial offering and before the free spins start you’ll be taken to a screen showing a graveyard; each grave you pick will reveal more spins or increased multipliers. Now the spins will start and during this feature Dr. Blackwood becomes wild as in the Full Moon feature. There’s a potential 25x multiplier available with the addition of Dr. Blackwood. There’s a couple of ways to approach this game – you can minimise the number of paylines, save some money and go for the free spins or try and make the most of the stacked wilds by maxing out the paylines. You don’t have to wait until Halloween to play this slot but if you turn the lights off and turn the volume up it will be a spooky experience on the 31st October. The graphics are also nice and detailed which lends this game an extra element of quality.